The Earth is in danger again! Battle through countless alien hordes using incredible new power-ups and bonus stages to help you defeat the alien bosses with style. It's Space Invaders, but now it's Extreme. 05-13-2013 vigorousjammer Box Text 30 YEARS OLD AND STILL WORTH EVERY POINT The Earth is in danger again! Battle through countless alien hordes using incredible new power-ups and bonus stages to help you defeat the alien bosses with style. 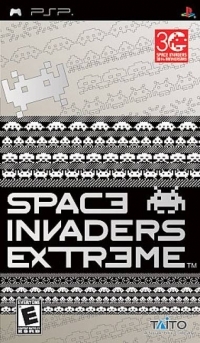 It's Space Invaders, but now it's Extreme. 05-20-2012 gaiages Box Text The Earth is in danger again! Battle through countless alien hordes using incredible new power-ups and bonus stages to help you defeat the alien bosses with style. 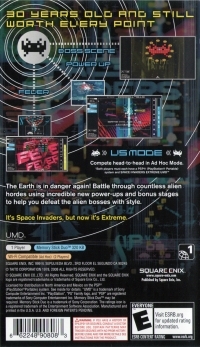 It's Space Invaders, but now it's Extreme. 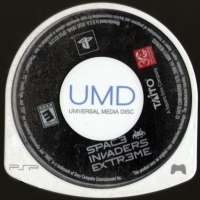 This is a list of VGCollect users who have Space Invaders Extreme in their Collection. This is a list of VGCollect users who have Space Invaders Extreme in their Sell List. This is a list of VGCollect users who have Space Invaders Extreme in their Wish List.